A man passes by Mambule car graveyard in Bwaise, Kawempe Division, Kampala. Car wreckages are collected from all over the country and deposited here before they are dismantled for their spare parts and scrap metal. Inset, a worker chops what remains of a car into smaller pieces to be sold as scrap. PHOTOS BY HENRY LUBEGA. There is a new number plate hijacking trend. Hi-jackers follow you to a parking lot, after you leave your vehicle, they remove your number plate and wait. When u come back and drive off, they follow you. They then overtake you, displaying your number plate out of their window as if you just lost it and they want to give it back to you. When you stop to get your number plate back, guns come out and they take the car. Maybe even take you and your car. It's a very well rehearsed and organised plan and everything happens very quickly. Other motorists may not be aware of what is happening as you stopped the car yourself. Please alert others to this danger!!! Don't keep this news. Spread it. 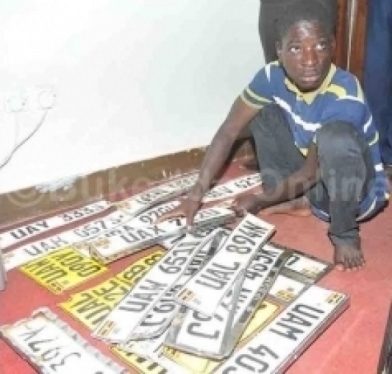 The Uganda Police busy playing politics, have now recovered dozens of car number plates from a garage located in Kisenyi Parish, Kampala District. But the cars are nowhere to be seen. According to police, the garage was being used by thieves to dismantle stolen motor vehicles. The car parts and scrap would then be sold to unsuspecting buyers in various shops. The raid, followed information about a stolen commuter taxi Reg. No. UAQ 723E that was being dismantled in the garage. Police Flying Squad officers who were dispatched to the garage last evening, recovered the vehicle in the garage but its engine and tyres were missing. During the search, 27 sets of number plates were recovered. 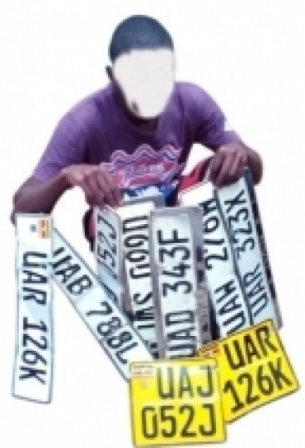 The recovered number plates include; UAK 693L, UAP 246U, UAL 547B, UAM 866H, UAJ 029B, UAN 270S, UAM 912Q, UAL 739D, UAM 597U, UAP 869H, UAL 883H, UAH 334M, UAH 024M, UAM 508A, UAP 708X, UAM605G, UAP 928S, UAR 234U, UAL O23U, UAM 234F, UAM 961A, UAR 703E. While the above were a pair of number plates police was also recovered single plates that included UAL 833B, UAL 245W, UAR 583M and UAL 159H. Kampala Metropolitan police spokesperson, Mr Patrick Onyango said the recovered number plates are being scrutinised to check whether they are not of reported stolen motor vehicles. "We have records of stolen vehicles. We will compare and see if they are the ones. They owners of the plates can also come to police to make statements," Mr Onyango said. Two suspects who were arrested during the raid, have been detained. Police records based on more than 5-years of stolen motor vehicle search and recovery indicate that while new motor vehicles that are stolen are sold in Kenya, DR Congo and South Sudan, old motor vehicles that are stolen are usually dismantled into spare parts and scrap and sold. Last year, police recovered seven stolen motor vehicles hidden in different garages in Kampala, Wakiso and Mukono districts. Kimera (ku kkono) ne Odongo. babiri be baludde nga balondoola ku bubbi bw’emmotoka. Baasanze baakayingizaayo emmotoka ekika kya Noah kapyata gye babbye mu galagi ekiro ekyo. Bino byabadde mu zooni y’e Kaabuuma mu minisipaali ya Makindye Ssaabagabo mu distulikiti y’e Wakiso, gye baakwatidde bavubuka babiri n’emmotoka ekika kya Noah nnamba UBB 882F gye babbye mu galagi emu. Abaakwatiddwa ye Daniel Odongo nga yeeyita Magezi enzaalwa y’e Alebtong nga yasoma bya kukanika mmotoka era yategeezezza aba ISO nti mu galagi mwe yayigira okuvulumula emmotoka ku sipiidi eya waggulu. Abavubuka bano baagambye nti baludde mu mulimu gw’okubba emmotoka era tewali mmotoka ebalemerera bwe baba bagyagadde. Beewuunyisizza abajaasi bwe baategezezza nti mu Uganda temuli mmotoka ebalema kutwala nga n’ezirimu obuuma obulondoola emmotoka (tracker) bazitwala nga nnyiniyo tategedde. Odongo yattottodde nti yatandika okubba mmotoka ku ntandikwa ya 2017 nga bakolera wamu mu kibinja n’ayongerako nti mu kiseera kino tamanyi muwendo gwa mmotoka ze yaakabba. Yagambye nti emmotoka ze basinga okutwala zibeera za buyonjo omuli noah, Prado, Premio wadde nga wiiki ewedde balina takisi kigege gye baatutte, wabula bettanira nnyo enkola empya ku katale. ng’agivuga ku sipiidi eya waggulu. Baayongeddeko nti emmotoka bwe bamala okuzibba baziyingiza ekikomera mwe basula olwo ekiro ne basimbula okuzitwala e Kenya nga tewali abakuba ku mukono. buli mmotoka gye batwala ne baweebwa omutwalo gw’e Kenya. Baagambye nti e Kenya bazitwalira Joseph Buruuli gwe baakazaako erya “Jose” ng’ono olumu bamusanga Busia ne bakyusa ennamba za mmotoka ne bassaako eza Kenya bwe kiba kyetaagisizza, kyokka olumu nti bazivugira ku nnamba za Uganda ne batakyusa okutuuka e Kenya. lw’okukwatibwa kw’abamu ku baali mu kibinja kyabwe okuli Wilson, Edgar Kiyemba n’abalala. Mu nnyumba baasangiddwaamu ne munnaabwe Marks Kizito era ono yeemuludde n’adduka nga kigambibwa nti ono mutabani wa nnannyini kalina mwe babadde babeera, era kigambibwa nti nnyiniyo abeera bweru wa ggwanga. Omu ku batuuze abaliraanyeewo yagambye nti buli lunaku bawulira emmotoka eziyingira mu kikomera ekyo kyokka babadde tebamanyi nti mulimu abantu abasulamu nga balaba kalina ekyazimbibwa ng’ate ne ggeeti ebeera nzigale buli kiseera. POLIISI ekubye amasasi mu bbanga ng’egobagana n'ababbi abaayingiridde omugagga w'e Nabbingo ne babba eby'omu nnyumba omuli n'emmotoka okukkakkana ng'ebasuuzizza omunyago. Bino byabaddewo mu kiro ekyakeesezza Olwokuna ku ssaawa 9:00 ogw’ekiro ababbi abattannamanyika bibakwatako bwe babuuse ekikomera kya Lauben Kulumba, omusuubuzi w’engoye ku kizimbe kya Nakivubo Complex mu Kampala ne bateeka be baasanze mu nnyumba ku miguwa okwabadde n’omukuumi ne batandika okunyagulula ebintu by’omu nnyumba. Robinah Nabbona muka Kulumba yategeezezza ng’obulumbaganyi buno bwe baabaddewo ku ssaawa 9:00 ogw’ekiro nga bonna beebase era baagenze okudda engulu ng'ababbi babatuuseeko oluvannyuma lw'okumenyi oluggi lw'emiryango. Police have arrested five people for allegedly stealing, dismantling and selling motor vehicles to scrap dealers. The suspects were arrested Monday from a rented parking yard located at the premises of Daliya Bembe in Nansana, Wakiso District. Acting on information provided to police by the area lookout teams about the suspicious activities taking place in the neighbourhood, Nansana Police led by SP. 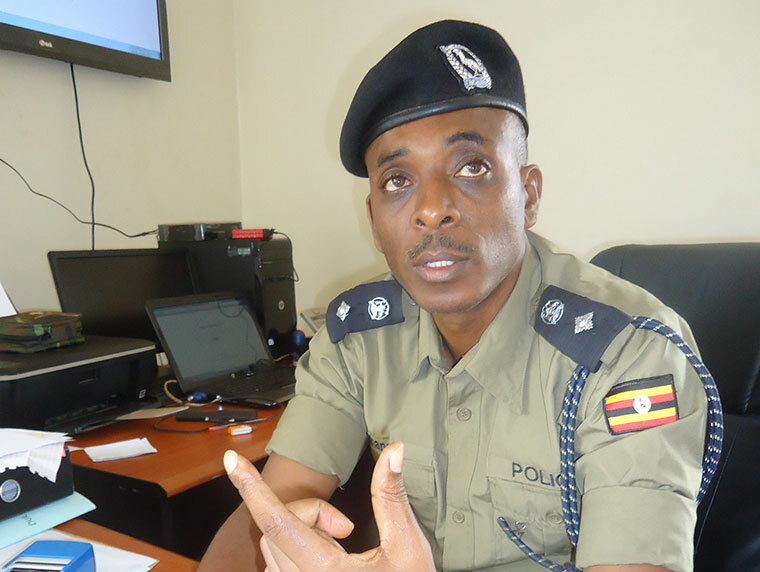 Benard Katwalo conducted a raid on the premises, Kampala Metropolitan Police spokesperson, Luke Owoyesigyire has said. Four of the suspects were arrested while dismantling a Toyota Noah car registration number UAR 157N. Police also found another car in the same premises a Toyota Premio UAK 982B, already dismantled. “This vehicle was reported missing on Wednesday August 29, 2018 by the owner Mr Joshua Lubega Babulira. It's said to have been stolen from his home at 2 am and a case was opened up at CPS Kampala vide SD REF. 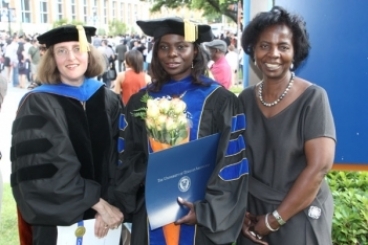 12/29/08/2018,” Mr Owoyesigyire said. A number of car accessories like brand new tyres, Mark II windscreens engraved with a registration number (UAF 325K), radio systems were reportedly recovered during the search. Police also discovered an isolated burning ground where the non-profitable vehicle parts like spinges, wires were suspected wasted into ashes to avoid any possible evidence. “During questioning, the suspects told police that a vehicle weighing between 1,000 and 1500 kg is usually dismantled in less than four hours and sold at an amount between Shs2 million and Shs3 million,” the police spokesperson added. He said in their statement, the suspects revealed that they dismantled vehicles instead of re-selling them in order to avoid being detected, tracked and arrested by the police. The suspects are currently detained at Nansana Police Station pending charges on various cases including stealing of motor vehicles and aggravated robbery. UGANDA, Kampala- The recomposed Police Flying Squad Unit (FSU) has recovered seven cars stolen from drivers and hidden in different suburbs of Kampala. Kampala Metropolitan Police spokesperson Luke Owoyesigyire yesterday said FSU recovered the vehicles hidden in garages and houses in places such as Nansana, Nateete, Lungujja, Ndeeba and Namanve. The recovered cars had been stolen in the last two weeks. “FSU registered complaints from owners of these vehicles and started investigations that included deploying covert officers at strategic places until we recovered some of them. The recoveries are here at CPS (Central Police Station) and others are being kept at other stations,” he said. The motor vehicles include a Toyota Hiace registration number UAP 693Z white in colour that was recovered from Nansana, Wakiso District and its case was registered at Nansana Police Station. A Toyota Premio UAF 782X white colour was recovered in the city centre and case recorded at FSU headquarters at CPS while motor vehicle UAG 193L with forged number plate UAU 340T, was recovered from Lungujja in Rubaga Division and its case was registered at CPS. Other recovered vehicles are; Toyota Premio UBA 738K grey in colour which was found in Nansana-Gganda and the case is being handled at CPS, Toyota Mark II UAM 598E white in colour found in Nateete-Wakaliga. The case was registered at FSU. A Toyota Ipsum UAW 957B blue in colour was recovered from Ndeeba while a Toyota Wish UBD 974F white in colour was recovered from the city centre. The cases are registered at FSU headoffice. “These vehicles had been hidden inside washing bays while others were concealed in garages and homes. Motor vehicles are often stolen from streets, outside places of entertainment, supermarkets and office buildings,” Mr Owoyesigyire said. In April, police exposed tricks used by thugs to steal vehicles that included duplication of car keys, deliberate accidents, duplicated number plates and car break-ins. This was during the release of the report on 200 cars stolen from Kampala and its outskirts in 2017. The report showed Toyota Premio were most targeted vehicles by thugs making a 35 per cent of car thefts followed by Toyota Spacio, Raum and Ipsum that came in second, third and fourth, respectively. Police in Mbarara has started an operation against number plate theft. Three suspects have been arrested with hundreds of number plates they plucked off vehicles around Mbarara town. Rwizi region police spokesperson Samson Kasasira, who confirmed the arrests, said there has been rampant theft of number plates in Mbarara as each suspect has over 100 number plates on his name. "We have had rampant cases of number plate thefts and fortunately we have been able to arrest a number of suspects behind this crime. Among the three suspects we have, each suspect to his name he has over a hundred numbers that they have stolen," Mr Kasasira said. He added that some of the number plates are stolen from parking lots that do not have security guards while some are stolen from homes at night. "They work in rackets and the bigger team is outside there," Mr Kasasira said. He said police has also obtained telephone lines the suspects have been using to collect money from the victims and appealed to members of the public have been conned in the same way to bring evidence to police. "We only have three suspects and the lines they have been using to obtain money. We request that whoever that have been affected by these numbers 0706003109, 0755070971, 0755726492 and 0750917808 either in Mbarara or you have been a passerby going to Kabale and you have lost your number plate, or you have been coming from Kampala to tour areas of Mbarara and you have lost your number plate but paid money to get it back, you can help us in the prosecution of these suspects and also help recover other number plates," Mr Kasasira said. 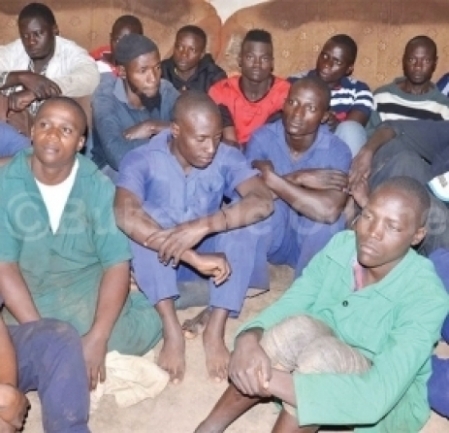 The three suspects were identified as Nasasira Arnold (26), Rashid Sseruwada (18) and Kanyesigye Suwedi (18). They are all residents of Katete Mbarara municipality. Nasasira was shot in the heel when he attempted to grab a steering wheel of the police vehicle as they approached Katete Bridge. The bridge crossing river Rwizi links Lugazi to Katete ward in Mbarara Municipality. Mr Kasasira says that Nasasira wanted to swerve the police vehicle into river Rwizi so as to escape which forced police to shoot at him in the foot. "We have one suspect who was shot in the foot as he tried to run away. We did this because we want to put our officers at risk. The police invest a lot of money to train these police officers and so we cannot let a simple thug take out five police officers just because he has to survive. As police we are telling anyone who is indulging in this act that if he tries to resist arrest we use all possible means to put you out. If it means putting you out of action we will do it. He tried to swerve off the car to River Rwizi at Katete Bridge after grabbing the steering of the car so in that process he tried to get out and was shot in his foot that is how he got shot," Mr Kasasira explained. Mr Kasasira said the suspects had specific mobile money agents whom they withdraw from who helped police get suspects. "Some of them we tracked their lines to the mobile agents where they withdraw money from. They have specific agents so that is what helped us and the help of the community who come to us. This crime should be stopped because it affects people because when you do not have a number plate as police we impound your car unless you have come and report to police that your number plate has been stolen and we give you a grace period,” Mr Kasasira said. The suspects were charged with stealing from a vehicle and demanding property with menace. They will be taken to court to answer those charges. Police Flying Squad, kikoze ekikwekweto ku bavubuka bano abatalina mirimu mubwamakanika nga babba mmotoka ne bazitema sipeeya nebasubula. Ekikwekweto kyatandikidde ku mmotoka ya Erisa Kyaligonza, Isuzu Elf UAX 489J gye babba e Kagadi ne bagireeta e Kampala bwe baagikwatidde ng’etemeddwa sipeeya ne basangayo n’endala ezabbibwa mu bitundu eby’enjawulo. Kyaligonza yagambye nti, mmotoka ye baagibba mu kiro kya Paasika ku ssaawa 6:00 okuva ku ssundiro ly’amafuta ku kyalo Kenga we yali esula. Yagasseeko nti, ddereeva waayo, Businge Mwesigye ng’akolagana ne God Mwesigye nga bayambibwako Livingstone Mawejje makanika okuva mu Ndeeba okuliraana FACO, be babba mmotoka era ye yategeera nkeera nti mmotoka ye yabbiddwa. “Ekyasinga okutuyamba ababbi mu kupapa baasuula akapapula okwali ennamba z’essimu kwe twatandikidde ne tukwata God ne munne ne batulagirira e Kampala mmotoka gye baagitunda,” Kyaligonza bwe yategeezezza. Yagasseeko nti, batuukidde ku poliisi emu mu Kampala kyokka ne basooka bababuzaabuza okutuusa lwe baagenze mu Flying Squad eyabayambye okugenda mu Ndeeba n’ezingako Galagi zonna. Mmotoka ya Kyaligonza n’endala eziteeberezebwa okubeera enzibe zaasangiddwaayo nga bamaze okuzitema sipeeya nga n’ebitundu ebirala bamaze okubitunda poliisi n’ekwata buli makanika gwe yasanzeeyo. Sipeeya wa mmotoka nnya (4) ne bamutikka ku loole bbiri ne bamutwala ku CPS nga bwe bakyanoonya ebirala. Livingstone Mawejje yategeezezza poliisi nti, mmotoka yagigula ku God Mwesige ng’era baali bakkiriziganyizza obukadde 9 n’asooka amuwaako busatu ng’endala yali waakuzimuwa ng’amaze okutunda mmotoka. Ono yagambye nti, eno si ye mmotoka gy’asookeddeko, yaakabba ezisoba mu ttaano ng’azitema sipeeya n’asaba abalala abaabadde bakwatiddwa bateebwe. Kino kijjidde mu kiseera nga poliisi yaakamala okufulumya lipooti ku mmotoka ezaabbibwa mu 2017. Lipooti eyakolebwa Flying Squad yalaga nti, emmotoka 105 ze zaali zibbiddwa ate bodaboda zaali 109. Omuduumizi wa Flying Squad, Herbert Muhangi yagambye nti, ekikwekweto ekyakoleddwa kyabadde kyakunyweza muyiggo gwe baliko ku babbi b’emmotoka bonna. Yagasseeko nti baakutte abantu abasoba mu 10 wabula bwe baalonzeemu, baakizudde nti abeenyigira mu bubbi buno bali basatu era be bagenda okusigaza abalala babayimbule ku kakalu ka poliisi. Galagi zonna omwasangiddwa ebyuma by’emmotoka enzibe, byassiddwaako kkufulu n’abaserikale okutuusa ng’okunoonyereza kuwedde. 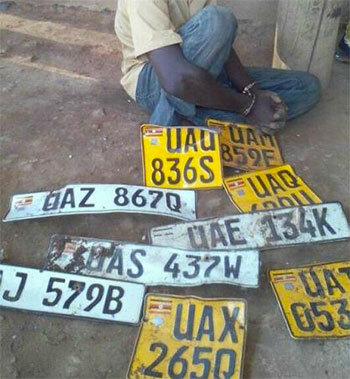 Police in Kirinya have arrested a notorious vehicle number plates thief who has been extorting money from residents of Kirinya, Bukasa, Kito, Namataba and parts of Bweyogerere towns. 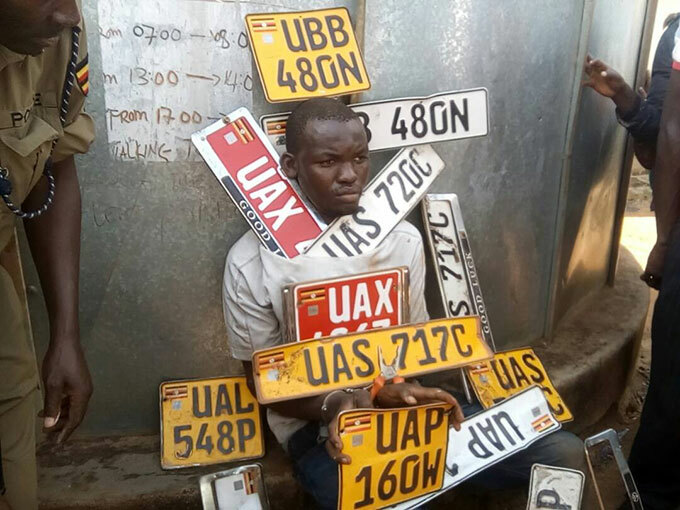 Tony Omaswa Ssemudu a resident of Kito was arrested with 14 stolen vehicle number plates. Number plates theft is on the rise because it brings in quick cash from the victims who fear traffic police penalties. According to police, the thieves target parked cars in the residential neighbourhoods and parking yards in the Metropolitan Kampala and other towns. ASP Celestine Nujonzima, OC Station Kirinya police station said they have been having a sleepless night for the last three weeks following numerous complaints from the residents that Ssemudu was vandalising their cars, leaving behind his name and telephone and mobile money numbers demanding for money before giving back the plates. "We got his photography from the Facebook and distributed to people and started tracking him, good enough today we arrested him and he produced 14 number plates," Nujonzima said. Ssemudu confessed to stealing the number plates but claimed he was only doing it for survival purposes. "I was one time arrested and taken to Bweyogerere police station, then, a lady came complaining that they had stolen her number plate and the suspect is demanding Shs 2 million for her to get back the number plate, this is when I picked up the idea because I have been sent away from our home, I do not have ways of getting money to sustain my welfare so this is how I get money for living," he said. Ssemudu was later transferred to Kira police station from where he will be produced to court. Deputy ASP Maliserino Mulema, chief investigating officer at Kira police said Ssemudu faces 14 counts. On September 1, 2011, Eric Alema walked into Maybach, a car bond off Ggaba Road in Kampala. He was shopping for a car and, indeed, found one that fitted his budget and specifications. The car, a Range Rover Sport, would cost him Shs160m. But this was the start of an almost seven-year ordeal that would bring him face-to-face with a rusty justice system that works through some individuals in government agencies such as police and the Directorate of Public Prosecutions, to defeat justice. A few weeks after Alema had taken possession of the car, he was alerted it was a stolen property from the United Kingdom (UK). This was corroborated by Interpol Uganda, which went ahead to impound the luxury vehicle. The car had allegedly been brought into the country by Jack Arthur Richardson, a dual citizen of Uganda and UK, assisted by Moses Esimu, alias Momo, a Kampala businessman, who bonded it at Maybach Car Bond, owned by Wilson Kanyankole. Investigations revealed that the car had been smuggled into the country using fake documents with the help of some customs officials at Uganda Revenue Authority (URA). Esimu has variously featured in police investigations, where with the assistance of a well-connected ring, is accused by different security agencies of smuggling stolen cars from Europe into Uganda. In 2016, the then director of Interpol, Mr Asan Kasingye, told this newspaper that UK had requested Uganda to assist investigate Esimu and four other Ugandans over links with a UK citizen cited in a number of car jacks. They are, according to documents seen then, being investigated over their alleged role in the theft of more than 53 luxury cars from UK between 2009 and 2011. In the same year, Esimu had unsuccessfully filed a case in which he sought to stop the return of 36 stolen cars to UK. The luxury cars, which included Ranger Rovers, Audis and BMWs, among others, had been impounded from different car bonds and individuals in Uganda. Esimu declined an interview with Sunday Monitor and did not reply text messages sent to his known mobile telephone number. “Go ahead and write what you want. Nothing will happen to me. We run this country and I will look for you if you don’t stop writing your ‘crap’ about me,” he said then in a telephone interview. Richardson denies ever bringing in the car but admits that the container in which the car was smuggled into Uganda was cleared under his name by a man he declined to name. The man, who Richardson says is a UK citizen, had asked him to help him with his (Richardson) details to clear his goods, which included the stolen car. “It’s been seven years. This was in 2011. I even don’t remember the guy who I gave my TIN and other details. Besides, I don’t live here (Uganda) and it has already been established that at the time of clearing the goods, I was nowhere near Uganda. How then could I have brought in this car?” Richardson says. Kanyankole says he is being accused falsely as there was no way he could know that the car, which had been brought to his bond, was a stolen property. “I have been exonerated by different investigations. How could I know that the car had been stolen? It had been cleared by URA. URA knows how and who brought it into the country. I provide safe storage of cars and I don’t investigate which car has been stolen,” Kanyankole said in an interview. After the car had been impounded, Alema sought out BMW Financial Services, with the view of buying the car if it was available. “They (BMW Financial Services) needed about £25,000 (Shs125m) to re-ship the car back to UK. To them, this wasn’t making financial sense so they floated it (put it up for sale) on the market,” Alema says. “That is when I took advantage and negotiated to buy it. We settled at £20,000 (Shs100m) and that is how I regained it legally,” he says. The car, according to Alema, was later released after BMW Financial Services wrote to Interpol Uganda, advising them to hand it to him. Alema has since sold it to another user. After Alema had legally taken possession of the car, he pursued the case with police as he needed a refund of his money. Earlier, he had filed a case at both Interpol and Kampala Metropolitan Police (KMP). His experience was not good. “These people (the suspects) are connected. First, the case was transferred from KMP to CID (headquarters) in Kibuli without my involvement. I was surprised but they told me it was CID that had the capacity to investigate it,” he says. The transfer, Alema says, could have been tactical as all pointers indicated a wider connivance. In a January 8, 2018 complaint addressed to the deputy Director of Public Prosecutions (DPP) and copied to the Inspector General of Police, Alema told of how his case had been mismanaged and unilaterally ordered to be closed without justification. “(Betty) Khisa on June 15, 2015, in a correspondence … advised (Charles Babweteera) to close the case file because there appears to be no complaint,” he wrote in a complaint titled “mismanagement of a case of theft of vehicle and obtaining money by false pretence”. Khisa is the deputy DPP in the prosecutions divisions. However, Alema wonders how Khisa could conclude that there was no complainant yet he had filed several complaints with both KMP and CID. According to Alema, this, together with a string of incidents, pointed to possible connivance to frustrate a case. “At some point Muwanga indicated some of the suspects had refused to cooperate (record statement). I wonder how a suspect would refuse to record a statement in which he is accused of a crime,” Alema says. Joshua Muwanga was the investigating officer. In a telephone interview, Muwanga admitted to have failed to conclusively investigate the case because there “had been lack of cooperation on the part of some suspects”. He said he did whatever was within his powers to bring the suspects to book and could not be accused of conspiracy. “Sometimes police officers are blamed for nothing. For sure I did what I needed to do, but I could not interview some of the suspects who were part of the investigation,” Muwanga said. Alema wonders why Babweteera forwarded an incomplete file to the DPP well aware that key information from some suspects, who were known to police, was missing. Babweteera, from the local government and anti-corruption department, who examined the file, denies any wrongdoing and says his only role was to examine the file and write a report. “May be Alema failed to understand that we could not interview Richardson. I personally wrote to Interpol and Immigration to track down Richardson, who was the consignee of the container (in which the car was brought into Uganda). I can’t be the same person to have connived to frustrate the case,” he said. However, Babweteera could not explain how a suspect (Richardson) who had been identified and put on red notice, could not be arrested yet he would come in and out of Uganda. Subsequently, Khisa ordered for the closure of the file in a letter addressed to CID director. However, he maintained in an interview with Sunday Monitor that the file was never closed. “We were waiting for the arrest of Richardson who was out of our reach. We never closed the file,” he said. Earlier, Alema had filed a complaint with the Police Professional Standards Unit (PSU) to help him discipline some CID officers who he suspected to have frustrated the case. “They (PSU) kept tossing me from one desk to another. I gave up and counted my loss,” he says. After a torturous six years, Alema says, he had almost given up on the case until, through a friend, he chanced on Herbert Muhangi, the commandant of police’s Flying Squad Unit. “I explained to him my dilemma, dismay and contempt for some police officers and the DPP. He looked disturbed and surprised. He told me this was unacceptable and he would personally investigate it,” Alema says. In an interview, Muhangi told Sunday Monitor, the file had for six years had no progress, which raised suspicion. “To some extent, I suspect there was a plan to frustrate the case. The investigating officers had told him (Alema) that it was a civil case yet there was some elements of criminality. That is why I guided Alema to raise a compliant with the DPP with the view of retrieving the file,” he said. A few days later, according to Alema, the file had been retrieved from CID and there had been subsequent progress on the same. In a January 9 letter, Sharon Akandwanirira, a senior State Attorney, ordered CID to forward the file after a complaint had been raised through the DDP Complaints Desk. The DPP studied the file and William Byansi, the head of general case work department, wrote to KMP advising that the suspects be arrested and prosecuted. “Upon extensive review of the evidence gathered in both files plus earlier opinions therein, we have found that the charge of obtaining money by false pretence is sustainable (against the suspect). You are therefore advised to prepare charges and forward them to RSA (Resident State Attorney) Buganda Road for subsequent proceedings,” Byansi wrote on January 15. Subsequently, Richardson, Kanyankole, and Esimu were arrested and arraigned before Buganda Road Court on January 22 on charges of obtaining goods (money) by false pretence. According to Kanyankole, Maybach was never involved in the importation of the car or its registration. “Alema knew Maybach was acting on behalf of Esimu. All the money we received from Alema was handed to Esimu, who acknowledged receipt,” he says. Kanyankole believes that the case should be reviewed to ascertain how URA would clear a stolen car and establish who brought it in. Richardson, the importer says: “I am going to sue Alema for defamation. He has been paying newspapers to write about me false stories. He says I connived with people to sell him a stolen car. But the people he talks about I have never met them. This is total rubbish”. Interestingly, Richardson has already worked on an agreement to refund Alema’s money with already $10,000 deposited in his account. Omwaana omuto atakirizibwa kukola wano e Buganda nga ali ku Police olwokubba registration number plates za motor-car enyingi ddala. Abadde abba nnamba puleeti za mmotoka e Mukono poliisi emukutte. POLIISI y’e Mukono ekutte n’eggalira omuvubuka abadde yagufuula omulimu okutemanga ennamba z’emmotoka n’azikweka olwo n’asaba bannyinizo ensimbi okuzibaddiza. Aduumira poliisi y’e Mukono, Rogers Sseguya ategeezezza nti omuvubuka ono amannya ge bagasirikidde olw'okuba bakyaliko banne bwe babadde bakolagana naye be banoonya. Sseguya agambye nti ono akwatiddwa mu kiro ng’ava okubba nnamba ppuleeti y’emmotoka mu kikomera ky’omutuuze ku kyalo Ssonde ng’ono y’atemezza ku poliisi n’esitukiramu n’emusanga. Registration number plates enyingi ddala nga zilagibwa ku Police. Osasira bananyini bidduka abakyasasulira ebidduka bino okubigula nga tebalina registration cards ezebidduka bino okukakasa obwananyini. Kizibu nyo okununula plates zino okuva mu Police ya Uganda awatali kuwa nguzi empitirivu okukamala! Agambye nti omuvubuka ono atemera mu myaka nga 16 abaddenga aliko omugagga gw’akola naye nga kati poliisi gw’ekyagezaako okulinnya akagere. “Ono abasirikale baamusanze ng’alina obupapula obugamba nti bw’oba oyagala nnamba ppuleeti y’emmotokayo, weereza essente ku nnamba eno. Atutambuzza mu bifo byonna gye babadde baakweka ennamba z’abantu ne tuziggyayo nga ziri wano,” Sseguya bw’annyonnyodde. Ategeezezza nti omwana ono bazzenga bamukwata mu misango egy’enjawulo omuli okubba sikulaapu n’emirala kyokka nga bw’atwalibwa mu kkooti ng’asindikibwa e Naguru mu Remand home gye basibira abaana ng’amala ekibonerezo ng’akomawo ng’atandikira we yakoma. Poliisi ekutte omuvubuka ono n’abakulembera ekiro ne bagenda mu byalo eby’enjawulo gye babadde batema ennamba z’emmotoka z’abatuuze ne baziggyayo ng’era 16 ze zisangiddwa mu woofiisi ya DPC. 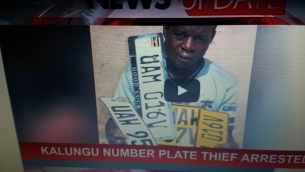 A 25-year-old man in Uganda, Andrew Ssekayega, is suspected to have been stealing number plates from motorists in the country and then asking the distressed victims for a ransom. The Global Positioning Systems are easily removed from cars by the many dodgy car garages surrounding the crime ridden International city of Kampala. UGANDA, KAMPALA- After a seven-year hunt, police have finally arrested a Briton accused of stealing and smuggling cars from Britain into Uganda. The Flying Squad Unit (FSU), a violent crack unit of police arrested the suspect after he was tricked by Mr Eric Alema, a victim of his erroneous car deals helped by his friend who pretended as a car buyer. The Briton who also possesses Ugandan passports, shot to limelight in 2011 when he stole and sold a UK made car to Mr Alema at Shs120 million but later discovered that its in-built Global Positioning System (GPS) vital for tracking the vehicle had been dismantled perhaps to evade detection by the manufacturer. Mr Alema, a UN employee said he had been tossed up and down by police officers especially in crime intelligence and investigations departments such as Criminal Investigations Departments (CID) and Rapid Response Unit (RRU) now FSU. “I was tossed for several years and police officers never bothered even when I could tell them that I had information about the suspects’ whereabouts. I think they had bribed many officers in CID. I was fed up of the police jokes, I went and secured a directive from DPP [Directorate of Public Prosecutions],” Mr Alema said. Kampala Metropolitan police spokesperson, Mr Luke Owoyesigyire, confirmed on Friday that the suspected was arrested by FSU on Friday morning at Bugolobi, a Kampala City suburb in Nakawa Division. “We have him here [Kampala Central Police Station] and we are interrogating him. We want to get good information that will help us to arrest his accomplices. It is a big racket and his arrest is an opportunity for us to arrest the whole group,” Mr Owoyesigyire said. After his second attempt to seek CID intervention failed in 2015, Mr Alema petitioned the DPP on January 8, 2018. The Directorate of Public Prosecutions (DPP) responded a day later directing the Criminal Investigations Department to submit the two files; GEF/ 698/2011 and KMP GEF/113/2015 to his office for review. Police submitted the files to DPP and upon reviewing; the DPP noted that there was satisfying evidence in the files to prosecute Mr Richardson Jack Arthur, a British citizens who and his two accomplices, Mr Wilson Kanyankole and Esimu Moses aka Momo. “Upon an extensive review of the evidence gathered in both files plus the earlier opinions therein, we have found that charge of obtaining money by false pretences section 305 of the Penal Code Act is sustainable against Kanyankole Wilson, Esimu Moses alias Momo and Waswa Jack Arthur Richardson,” reads the DPP’s letter to CID. The DPP added that the conduct of the suspects to receive the complainant’s money in exchange for a car to which they had no proper documents is criminal. “The rightful owners of the car emerged and rightly asserted their claim to the car as a result of which the complainant suffered substantial loss. The suspects’ explanations do not add up,” Mr William Byansi stated in his response to CID on behalf of DPP. He advised CID to prepare the charges and forward them to Resident State Attorney at Buganda Road Court for subsequent proceedings. The cases of smuggling vehicles from UK to Uganda punched holes in Uganda Revenue Authority staff who allegedly connived with the alleged thieves to clear the stolen top-of-the-range cars. stolen from overseas, particularly the United Kingdom, to enter Uganda undetected. It has been a bad day for a 21 year old man identified as Moses Ogomo after being attacked by thugs and they took off with Shs3m that he was taking to Gulu to invest in his business. Mr Ogomo, an employee of Giant Aluminum Company in Jinja, had gone to Centenary Bank to change his money into denomination but unfortunately they had no change. He then decided to proceed to Bank of Africa but just a few meters from Centenary Bank, one of the thieves who were following him, forcefully opened the bag, grabbed the money from him and drove off. “I went to Centenary Bank to change my Shs3m but when they told me they don’t have the denomination of Shs1000 [one million], Shs2000 [one million] Shs5000 [one million] and coins for Shs50,000, I decided to go to Bank of Africa but when I moved out I talked to a friend I found parked outside whether she can give me a lift but as we were still conversing, suddenly I felt someone opening my bag and took off with my money,’’ Mr Ogomo said. He added: “I made an alarm and I jumped on a boda boda and I started chasing them but they knocked us down and I picked another one until when I found them on Alice Muloki road near Jinja central market after knocking a garbage pit and their vehicle got stuck. Mr Faziru Bazibu, one of the eye witnesses said due to jam, the thieves [four] wanted to dodge it but fortunately they knocked a garbage pit at Jinja central market, abandoned the vehicle and took off after exchanging bitter words blaming the one who was driving of being a bad driver. Jinja District Police Commander Mr Christopher Mbabazi said they have discovered the vehicle Registration number UBB 431S Harrier Lexus, which was being used by thugs. According to Mr Mbabazi, it was stolen from Nakumatt in Kampala, but it had tracking system. He said through community policing, the boda boda men gave support to the victim by chasing the thugs until they abandoned the vehicle. Mr Mbabazi warned residents against carrying money in denomination because it becomes heavy and thieves can easily identify it. 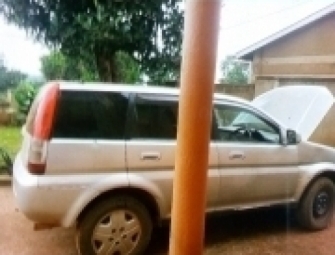 By press time, the vehicle was still parked at Jinja Central police station as police hunt for the thieves. OMUVUBUKA asumulula nnamba puleeti ku mmotoka z’abantu mu bitundu bya Kawempe n’emiriraano atutte abaserikale ku mwala n’abalaga w’azikweka n’asaba bannyini zo ssente. Okumukwata, abadde atwala akapapula okuli ennamba y’essimu ye mu maka gye yabbye nnamba puleeti. Ennamba y’essimu eno kw’alagira b’abbyeeko nnamba puleeti okusindikako ssente alyoke agibaddize! Hassan Ssekitoleko 20, omutuuze w’e Maganjo ku Lukadde aludde ng’anoonyezebwa poliisi ku bubbi bwa nnamba puleeti ye yakwatiddwa. Ssekitoleko yasooka kuyingira mu kikomera ekimu n’asumulula nnamba puleeti UAU 801A ku mmotoka ya Hassan Hushan n’eya Vincent Kizza nnamba UAW 797T ab’e Jinja Kalooli. Okuva lwe yabba nnamba puleeti zino abadde ateeka Kizza ne Hushan ku nninga bamuwe ssente abalagirire ekifo we yateeka nnamba puleeti z’emmotoka zaabwe. Kizza, omukozi mu kitongole ky’obwannakyewa ekya PACE, yategeezezza nti, “Tuludde nga twemulugunya ku bubbi bwa nnamba puleeti mu kitundu kyaffe naye nga tetulina gwe tukwata kyokka ng’omuntu atubba alekawo ennamba y’essimu y’emu eri ku 0704431635. Asaba ssente eziri wakati wa 50,000/- ne 100,000/- okutulagirira nnamba puleeti zaffe we ziri. Yagambye nti nnamba puleeti ye n’eya muliraanwa we Hushan zabbiddwa mu biseera by’ennaku enkulu ne baggulawo emisango ku fayiro nnamba SD:REF 25/28/12/2017 ne SD:REF 20/28/12/2017 ku poliisi ye Kawempe. Abatuuze balumirizza Ssekitoleko okuba mu kibinja ky’abamenyi b’amateeka abaabamazeeko emirembe mu biseera by’ennaku enkulu. Ng’ali ku poliisi, Ssekitoleko yakkirizza okubba nnamba puleeti ku mmotoka z’abantu n’agamba nti abadde yaakabba nnamba puleeti ttaano. Oluvannyuma yakulembeddemu poliisi n’abatwala mu bifo gy’abadde akweka nnamba puleeti z’abbye. Yabawadde n’olukalala lwa banne ababba nnamba puleeti ku mmotoka n’asaba poliisi emusonyiwe kubanga yababuulidde amazima n’atabatawaanya. Poliisi yamuggalidde ng’alindiridde kutwalibwa mu kkooti. Munsi ezikola emmotoka zino abantu bakwewunya bwebakulaba nga osumululako number plate kummotoka. Bakulaba nga atuuse okusumulula kumotoka zaabwe ebipampagulo obitwale obiguze abakola esigiri! Mpozzi nga ennaku zino governmenti ya Uganda nga bweli mumawulire amangi enyo nga nayo yeyiya, nabano abaana ababbi bali mukweyiya. Cattle farmers have been forced to sleep in kraals to protect their animals. Residents of Hoima in western Uganda have asked police and local leaders to find a solution for the rampant cattle theft in the area. The residents are worried about the vice that has been on the rise since March this year, where animals - mostly cows - are being stolen. Isaac Kirungi, a resident of Kigaaya village in Buhimba sub-county, whose entire herd of 20 cows was stolen early this month, argued that some farmers are now forced to sleep in the same building with their cattle, to protect their animals. He asked the Police to intervene and investigate the thefts and bring the culprits to book. Kirungi noted that the act is likely to increase poverty and discourage people from rearing cattle. Joyce Kabatalya, the Buseruka sub-county community development officer, said they receive complaints of cattle theft on a weekly basis. Jane Kiiza a resident of Buhuka village in Kyangwali sub-county said her six cows, each valued at sh600,000, were stolen in October. He now sleeps in the catle kraal to protect the remaining 20 cows. Police recetly intercepted two trucks along the Hoima-Kampala Highway transporting cattle suspected to have been stolen from Hoima. A source the stolen cows are slaughtered and the meat transported to Kampala, where the demand is high. Albertine region police spokesperson, Julius Hakiza, on Saturday said police had ramped up night patrols in the district. He said police investigations reveal that in most cases, herdsmen connive with cattle thieves. ‘‘We appeal to the community leaders to work with us. Cattle keepers should report to the village secretary of defence or chairperson to register their herdsmen before employing them,’’ he said. He said many cattle farmers employ strangers. The veterinary surgeons all over the world know that all farm animals are tagged without fail in this modern IT world. But when most cattle rearing traditional tribes on the African continent manage their ranches any how, animals will continously be stolen without trace, until Jesus Christ comes back. Very unprogressive African farm management indeed. POLIISI ya Flying Squad ekoze ekikwekweto mw'ezuulidde emmotoka 36 ezibadde zabbibbwa ku bannyinizo mu bitundu bya Kampala n'emirirwano. Kino kiddiriridde poliisi okufuna emisango egyekuusa ku bubbi bwa mmotoka mu Kampala n'emiraano, ekyagiwalirizza okusitukiramu n'ekola ekikekweeto okuzizuula. Omwogezi wa poliisi mu ggwanga, Emilian Kayima yagambye nti okuva mu mwezi gwa August okutuuka mu November mmotoka 136 zabbiddwa mu kitundu kya Kampala n'emirirwano wabula abasirikale ba Flying squad ne basitukiramu okuzinoonya era baakazuulako 36. "Waliwo okusomooza ku ku bubbi bwa mmotoka obukudde ejjembe naddala mu Kampala n'emirirwano wabula abasirikale baffe tebatudde, bazinoonya era ezimu zizuuliddwa," Kayima bwe yagambye. Yagambye nti oluvannyuma lw'okuzuula mmotoka zino poliisi ekyabuliddwako bannannyinizzo, bakyatubidde n'emmotoka 25 olw'okubulwako bannyinizo. Yategezezza nti obukoddyo ababbi bwe bakozesa okubba mmotoka ensangi zino mulimu okulondoola ebifo mwezisimbiddwa nga ku mabaali g'enguudo, okuyingira mu bikomera ne bazibbayo, okuzipangisa oluvannyuma ne bazibuzaawo ne bazitunda e Congo, South Sudan ate endala ne bazitwala mu galagi gye bazitemamu sikulaapu oba sipeeya. Yagambye nti ekiremesezza okuvunaana ababbi ba mmotoka mu kkooti kwekuba nti obujulizi bubuka olw'abantu be bazibbako obutayagala kugenda mu kkooti okubawaako obujulizi obubaluma, ekibawa ekyanya ne bateebwa ate ne bakomawo ne batandikira we baakoma. Kayima yasabye ababiddwaako mmotoka okwanguwa okuloopa ku poliisi nga balina ebiwandiiko ebizikwatako kiyambe mu kusasaanya amawulire mu bwangu. Banange wano e Buganda okukyusa amanya ga nanyini motoka kizibu ddala. Kiyinza nokutwala emyaka. Ye no bwotekako nabano abaana ababbi ba registration number negubula asala. Ekivaamu nga emotoka otereka waka. Nga otambuza taxi oba boda boda. Kale ye omubbi akusemberera mumotoka yo nga okugamba nti tolina na bwananyini bwa motoka era eno emotoka yiye. Akusonze mu emundu. Eno ababbi banne 3 nga bayingira motoka ne mundu nti vuga tugende ku police tukulope bwewabba emotoka yaffe. Tuli mukufa banange bwotabalekera motoka nebatwala! Emotoka aba URA nabo tebakiriza kuteeka manya gananyini motoka ku Registration card. Bateekako ga agent akuletede emotoka. Mbu okomawo mumwezi gumu ne agent wo nemitwalo 50 Uganda shillings okukyusa amanya ga nanyini motoka. Wano wempera Police amagezi. Bagende mu Uganda Revenue Authority banonye ba agent abatekebwa ku motoka nga bananyini zo. Bino bitama munsi enjavu etakola motoka neyetekesawo amateeka agatalimu makulu. Uganda Registration: UAN 280C Honda civic HRV. Estate Silver colour. 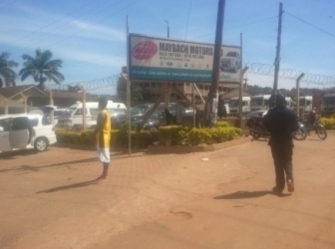 Police in Bweyogerere are holding a 16-year-old boy for alleged theft of vehicle number plates. Luke Owesigyire, the deputy spokesperson, Kampala Metropolitan Police, says the teenager suspect was picked up over the weekend following numerous complaints from motorists about the theft of their number plates. Owesigyire says the suspect has confessed sneaking into people's homes to steal the number plates. "After plucking off the number plates, the suspect leaves behind his contacts advising the vehicle owners to call him back and pay him between Shs 50,000 and 300,000 to recover them," he said. 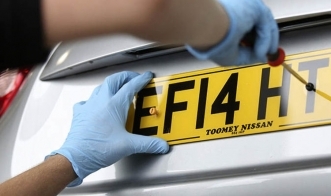 The theft of number plates have been on the rise in different parts of the country. It is surprising that the URA is silent over this matter. Uganda Revenue Authority has the monopoly to print out these number plates all over the country. And as any one can see together with this young man these cheap number plates are ill fitting on the vehicles. The metal substance used to make them is as soft as cardboard. The URA designs the short square size number plates to be installed on where a vehicle needs a long plate number plate. They are easily taken off with just one blow with a stone. But their price is astronomical and to obtain a replacement, it takes one year and about 1 million Uganda shillings. That is why black marketeering in motor vehicles is big business in all sorts of ways. The police seem to want the motorists to do their own policing as they cannot cope with this increased crime. A spike in crime ushered in by the festive season has persisted, with up to five vehicles stolen countrywide every day, the police has said. Herbert Muhangi, the commandant of the police Flying Squad, a violent crime crack unit, said 592 vehicles were stolen last year (2016) countrywide – more than double the number (264) stolen in 2015. “There is an increase in the theft of vehicles because people don’t listen to our advice. We urge them to install the Global Positioning Car Tracking System (GPS), which protects the vehicle by monitoring it online everywhere it moves worldwide,” he said. Muhangi said only two per cent of vehicles in the country have GPS devices installed. “GPS [devices] are sold for from $200 [Shs 700,000] to $500 [Shs 1m] depending on the type you want but people fear buying them thinking they are expensive yet they own cars worth about Shs 50 million,” he said. He added that all types of vehicles are targeted especially new four-wheel drives and company or organization vehicles. “After stealing the new vehicles, they [thieves] change the chassis number, number plates, colour and its interior to make it difficult for the owner to recognize. The old vehicles are dismantled into spare parts and sold to different markets like Kisekka market and motor garages in Kampala, Kisenyi, Mengo, Nakulabye, Bwaise and other suburbs,” Muhangi said. He said other stolen vehicles are driven across borders and sold to unstable countries such as the DR Congo. Muhangi said only 58 percent of vehicles stolen last year were recovered, while in 2015, 70 percent were recovered. He said currently, car thieves are raiding homes at night. Last week, he said, four car thefts were reported at different police stations within Kampala. James Kayondo, an auditor in Kampala, and Enid Sajjabi, an accountant at Makerere University, had their cars stolen last week. Kayondo said his vehicle, a Toyota Spacio UAS 085A, was stolen from his home in Bunga-Kawuku on January 13 at around 2.45am. He said he woke up at around 1:30am and heard dogs barking in the neighborhood. “I peeped through the windows but I didn’t see anything. After 30 minutes, when dogs stopped barking, I heard someone start my vehicle and when I peeped through the window again, I saw the gate opened wide and two people were inside my car driving it off,” he said. Kayondo said he made an alarm and neighbours woke up. Kayondo and his neighbours got into another vehicle and chased to the thugs. “Unfortunately we never got them and when we reported the theft to Ggaba police they also started tracking it but in vain,” he said. Sajjabi, the accountant, said her maroon Toyota Noah registration number UAY 094N was also stolen at 3am last week from her home in Komamboga, along Gayaza road. “I don’t know how they entered our fence but when I woke up, I saw the vehicle moving out. The thugs gave poison to the dogs and they died before they entered,” she said. She reported the case to Central police station (CPS) in Kampala and Sekanyonyi police post. “However, they assured us that the vehicle has not yet crossed the borders and it might be hidden in garages in Kampala,” Sajjabi said. Police says other vehicles are stolen from streets and parking yards. Others are stolen from washing bays and motor vehicle garages using duplicate keys. Muhangi advised people to deal only with garage or washing bay owners, but not workers. “Last month, we arrested a car washer who confessed to have given out his client’s keys to thieves to duplicate them. The thugs promised him Shs 200,000 for the job. After washing the vehicle, thugs trailed his client from the washing bay and they stole his vehicle,” Muhangi said. Muhangi said that last year, using the GPS, they recovered a vehicle which had been dismantled from Kisekka market. He said it was stolen from Kenya. “When Kenyan police informed us, we started trailing it on the GPS system until we found it,” he said. Muhangi advised people to park cars in gazetted areas with maximum security and CCTV cameras. He said car owners should install GPS devices and alarms. “Uganda Revenue Authority (URA) should ensure that every vehicle that enters the country has a GPS like in Europe, every vehicle has an airbag, you can’t drive a vehicle there without an airbag for safety of passengers in case of an accident,” he said. According to Muhangi, police is still stuck with over 50 recovered vehicles parked at different police stations. The owners, he said, would not recognize them because the thugs changed them.